All gardens have a range of permanent soil-borne disease organisms which are usually contained in a balanced environment where organisms, soil conditions, and hosts interact in a complex system. Garden plants only show symptoms of disease when this balance is disrupted and pathogen organisms become dominant. Gardeners can overcome disease by improving plant conditions, creating a hostile environment for the disease and by stimulating the growth of beneficial soil organisms. Soil-borne diseases in the garden include pre and post-emergence damping-off, like Fusarium, Pythium and Rhizoctonia species, root rot, including Phytophthora, vascular wilts caused by fungi including Verticillium and nematodes. Pre-emergence damping-off is where young seedlings decay in the soil before they appear above the soil surface. This occurs when conditions for seed germination are poor, such as cold, hot or very wet soil, poorly-drained soil, compacted soil or in the presence of undecayed organic matter. Post-emergence damping-off is where stems and roots of tender seedlings are attacked at the soil line and the seedlings fall over. High salt concentrations in the soil also cause damping-off. 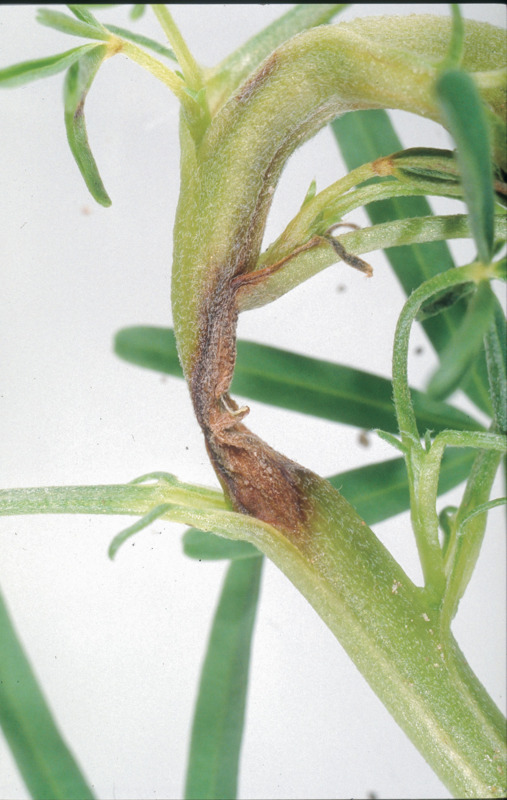 Root rots can affect plants beyond the seedling stage when the fungi invades internal root tissue, interfering with the supply of water and nutrients. Aboveground symptoms include loss of vigour, leaf yellowing, leaf drop, wilting starting at the growing tip, twig dieback, and sudden death. Vascular wilts are characterised by plant wilting and discolouration of the vascular system at stems or trunks and branches. Nematodes are microscopic, unsegmented worms. They include pest nematodes like the root knot nematode which invades the roots and causes them to form gall-like lesions that restrict water and nutrient uptake which causes wilting.